The millennial market is growing fast. Businesses must be switched on in terms of their marketing tactics to capitalise on the huge buying power of this generation. A recent study by the University of Southern California showed that there are 87.5 million millennials in the USA alone (ages 18-29). In comparison, 83.7 million people are known as ‘Generation X’ (ages 30-49) and 66.4 million are ‘baby boomers’ (ages 50+). The study, conducted by the university’s Online Master of Science in Applied Psychology programme looked at the psychology businesses must leverage in order to successfully market to this growing demographic. 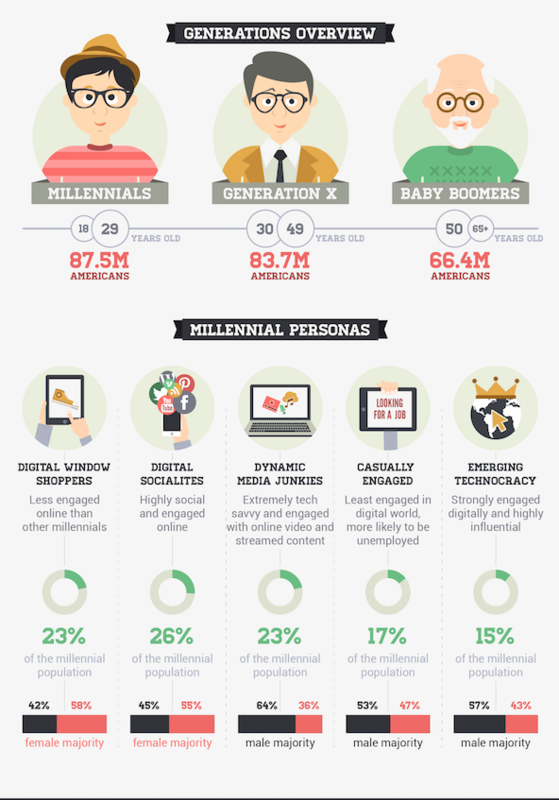 The millennial marketing influence lies mainly through the internet and digital devices such as laptops and smartphones, as the below excerpt from USC’s infographic shows. With over a quarter of millennials are highly social and engaged online – in comparison to just 15% of the baby boomer generation – brands that are not prioritising their digital marketing efforts in order to target this generation definitely should. In addition, 85% of millennials own a smartphone and 78% own a laptop and/or computer, showing that its the best way to reach them with marketing campaigns. Millennials also make up the smallest percentage of magazine and newspaper readers and spend the least amount of time watching television or listening to the radio in comparison to other generations. With almost 90% of millennials using social media, savvy brands are rapidly adapting to take advantage of this opportunity to influence. With 82% of millennials using social media interact with brands or retailers and 38% using it to discover new ones, online brand engagement is reaching an all time high, especially as millennials shop online more than any other generation (53%). In fact, 62% of millennials said brand engagement is more likely to make them a loyal customer. So what are the best ways for brands to target this key consumer market? USC’s study showed that due to millennials consuming content across multiple devices, marketers must create content with a multi-platform strategy. Additionally, 85% of millennials are more likely to make a purchase if it is personalised. One example of this is ASOS, the international online shopping platform. Extremely popular with the millennial audience, the brand has begun to tailor size suggestions for online users in the hopes that it will increase buying potential. The key is for brands to be authentic. Millennials are more likely to share good advertising than other generations, but dislike it when they feel ads are deceptive. In fact, one in three millennials will consult a blog before making a purchase. In an age where traditional media sources such as TV and radio are being pushed out by the internet, brands must reshape their marketing campaigns to successfully target the millennial audience. Emma is an innovative and results driven product marketing professional with over 10 years’ experience of making a direct impact on organisational presence, profitability and performance across the public, private and not for profit sectors.